I was standing in line to fedex a care package of blondies to a work colleague in California, when my stomach started growling. What’s the perfect lunch for the first really hot day of summer, I wondered. Lunch had to be something “stove free” for sure, but I also wanted something light yet sweet, still smelling the blondies through their shipping box as I took my turn at the counter. Walking home I passed a sprawling fruit stand, staggered with watermelon wedges, plums, and papaya, certainly an easy and healthy way to quench my sweet tooth. But just plain fruit wasn’t going to cut it for lunch, though I bought the watermelon anyway. By the time I made it to the next block, in front of the grocery store doors, I remembered the Union Square Cafe signature salad, with tomatoes, feta, and watermelon – so sweetly juicy, salty, and light all at the same time. I added jalapeño to my version, just because I’m a nut for chilies, but you can substitute 1/4 cup torn fresh basil leaves or mint if you’re not a fan of spicy. 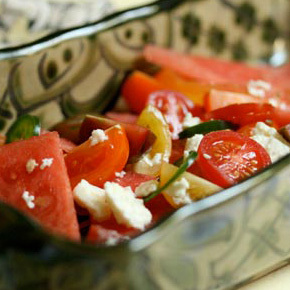 I got my Bon Appetite last night and saw a watermelon/tomato salad in there and then saw your recipe… it was a sign! So I made this for dinner tonight. I added some red onion and english cucumber to mine so it would be a throw back to horiatiki. The watermelon and tomato go so well together! Saw that delicious watermelon sorbet you made- divine!